Rep. Grove addresses his colleagues on the House State Government Committee, speaking out in favor of Speaker of the House Sam Smith’s constitutional amendment that would reduce the size of the Pennsylvania Legislature from 203 to 153 members. 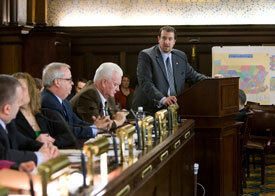 HARRISBURG - Rep. Seth Grove (R-Dover) voted this morning to advance legislation that would reduce the size of the Pennsylvania House of Representatives from 203 to 153. House Bill 153 would amend the Pennsylvania Constitution to reduce the membership of the Pennsylvania House of Representatives after the 2020 reapportionment process is completed. Grove noted the procedure for amending the constitution is lengthy. House Bill 153 was introduced by Speaker of the House Sam Smith (R- Jefferson/Armstrong/Indiana). The legislation was approved by the House State Government Committee, of which Grove is a member. It will now go before the full House for consideration.